Astrophotographer Bill Snyder captured this image of the Heron Galaxy from Sierra Remote Observatory -- Heavens Mirror Observatory in California’s Sierra Nevada Mountains on June 27, 2012. The aptly named Heron Galaxy appears to be spearing a fish in this night sky photo. Skywatcher Bill Snyder eyed Arp 84, also known as NGC5395, from Sierra Remote Observatory -- Heavens Mirror Observatory in California’s Sierra Nevada Mountains on June 27, 2012. Snyder used an Apogee U16 camera with Planewave 17-inch scope, Astrodon LRGB filters and an exposure of 14 hours. A colliding or interacting galaxy is one whose gravitational field disrupts another. This can be by just disturbing the edges of a galaxy to a large galactic collision. 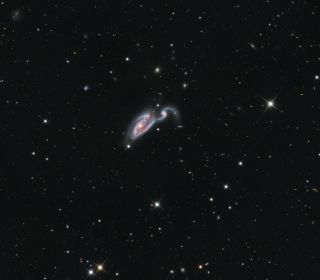 NGC 5394 is thought to be an interacting galaxy because it may have spiraled through NGC 5395 creating its unique appearance. The spiral arms of the smaller galaxy resemble the head and neck of the heron while the larger NGC 5395 makes up the body of the bird. Both galaxies are located in Canes Venatici, roughly 162 million light-years from Earth. A light-year is the distance that light can travel in a year, or about 6 trillion miles (10 trillion kilometers).